New weanlings get some socialization from a Goatsbeard goat hand. Weaning the female kids allows the farm to start saving milk to make cheese. The goat kids will be fed a mixture of goat milk, store-bought cow milk and milk replacer. I have good news for all you goat cheese lovers! About half the main Goatsbeard herd has kidded out, and the rest of the main herd should finish in the next two weeks. The yearlings will kid a little later, in early summer. This means that it’s time to start saving milk and making cheese. Herd manager Jenn says we’re about ten days out from having fresh cheese to sell! Those of you who haven’t spent time on a dairy farm, might not fully realize that this gift of milk and cheese comes with a hardship. This is the time of year when we have to start saying goodbye to most of those adorable goat kids. Producing milk, cheese, yogurt, anything that comes from milk, means kids, calves, or lambs that have to be separated from their mothers. To some degree, it’s a hardship for all involved. We have many practices that we use to minimize stress and discomfort for the goats. This week we loaded up twelve male goat kids to head to the sale barn in Mexico, Missouri. For those of you interested in buying or selling livestock in mid-Missouri the Midwest Exchange Regional Stockyards is a great resource. You can buy everything from fertilized eggs for hatching to an entire herd of goats or even cattle, and all sorts of other random stuff, such as a jar or two of hand-picked hickory nuts and various farm equipment. While we sell most of our kids through the stockyards, you can call also contact us directly if you’re interested in buying an animal. Our female kids will be great milkers, and the boys can be raised for meat or kept as pets. Our Lamancha mixed-breed goats are known for being very friendly and personable animals. They’re fun to have around and love to eat the stuff your other livestock might avoid -- brush and weeds! The males are the first to leave, because at most we’ll only keep one or two to raise for meat. We aren’t raising breeding stock, and even if we were, only the best of the best males are kept to be breeders -- we just don’t need that many of them. We have two mature bucks to breed our herd of fifty does, and we like to get our bucks from off the farm to bring in new genetics. We have also started separating some of the older female kids from their mothers to be bottle fed. The young females get separated for two reasons. Bottle feeding tames them, making them easier to handle in their adult life--very important for dairy goats which get moved and milked twice a day! In the long run they will be less stressed and happier if they are tame and calm around humans. The separated kids will get a mixture of goat milk from their mothers, milk replacer from the feed store and store-bought cow milk. This allows us to keep most of the milk from our does and start making cheese. This kid got her first drink from a bottle and got over her shyness during the first morning she was put in the weaning pen. Socializing with the newly weaned kids is important and fun work. One of the ways we try to make this part of the cycle less stressful is by keeping does and kids stay together for a little while. Most dairies immediately separate the offspring from the mothers, but we’ve settled on a system that keeps doe and kid together for at least two weeks. Keeping the kids with their mom’s for awhile makes them stronger and healthier in the long run. Through nursing the kids get antibodies and the beneficial bacteria they’ll need for their rumen. Both does and kids get to experience and benefit from the shared relationship; it’s a natural part of being a goat. 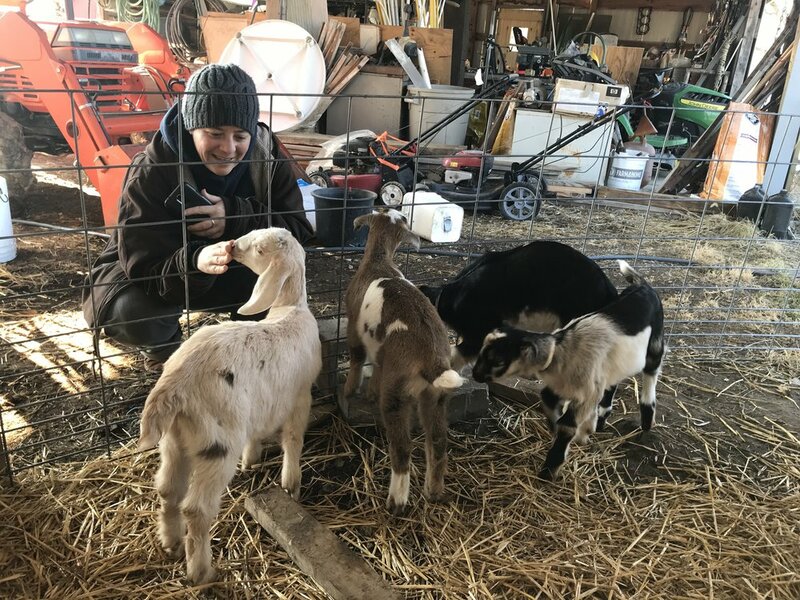 We know from experience that does and the kids will survive the weaning process, and we treat our goats with compassion and reduce stress where possible. Some people feel that the best answer might be to not eat meat or dairy or any animal products. But we can’t imagine our lives without goats. We love them. We love not just the milk or the meat, but their personalities and the time spent being among them. We appreciate that they can take grass and shrubs we could never eat and turn it into healthy food we can enjoy. They do all this within a relatively intact ecosystem that also serves birds, insects, native grazers and browsers, and so many others. How Do Goats Stay Warm in This Cold Weather?